Visual Studio Code>Programming Languages>Angular FilesNew to Visual Studio Code? Get it now. You can now leverage angular-cli resource generation options without remembering their names, while keeping things simple and fast! 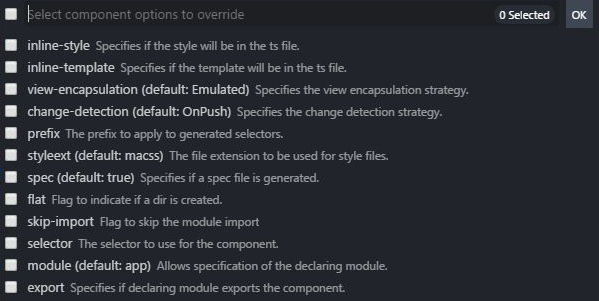 Support generating module with routing praram eg. "my-module --routing" similar to "ng g module my-module --routing"
Added configuration to hide some menu names, thanks to roknow for contribution! Angular-Files now supports angular-cli.json and you can use custom prefixes, different style extensions. Note: if you not using angular-cli it is possible to add angular-cli.json to customize file generatiion.